* Vaccination against Pertussis (whooping cough) is required for all incoming 7th Grade Students...we've partnered with Walmart for special pricing! To protect against Whooping cough or Pertussis, California law requires all incoming 7th grade students to have the TDAP vaccination and proof of immunization before they can attend school. 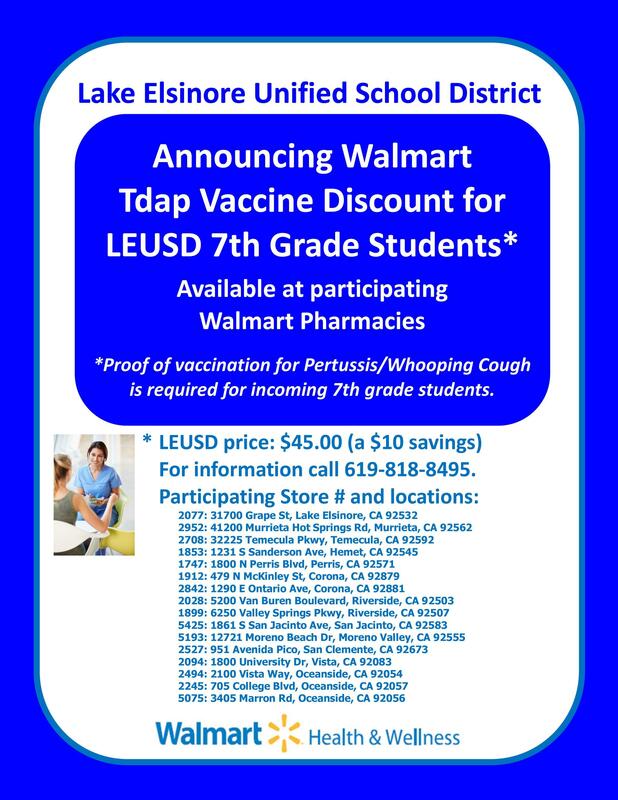 In partnership with Walmart Pharmacy, Tdap vaccinations will be offered at a special discounted price for LEUSD students--$45.00--a $10 savings! No appointment is necessary—just visit your nearest Walmart Pharmacy and mention LEUSD's Tdap announcement, or print a copy of our Tdap flyer (linked below and on our Facebook page) to claim your child’s Tdap discount. For more information, please telephone the Walmart pharmacist/coordinator at 619-818-8495. Important: Please bring your child’s immunization card with you, so Walmart's pharmacist can update proof of vaccination.